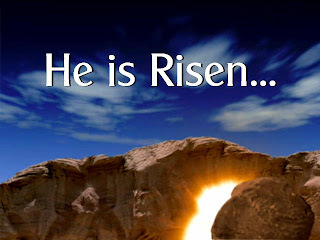 "He is not here: for he is risen, as he said. Come, see the place where the Lord lay. And go quickly, and tell his disciples that he is risen from the dead; and, behold, he goeth before you into Galilee; there shall ye see him: lo, I have told you. And they departed quickly from the sepulchre with fear and great joy; and did run to bring his disciples word. And as they went to tell his disciples, behold, Jesus met them, saying, All hail. And they came and held him by the feet, and worshipped him. Then said Jesus unto them, Be not afraid: go tell my brethren that they go into Galilee, and there shall they see me."